Tammy365: Isn't every Friday Good? Are you looking forward to a day off tomorrow? Some people celebrate the holiday without remembering the real meaning of Good Friday. 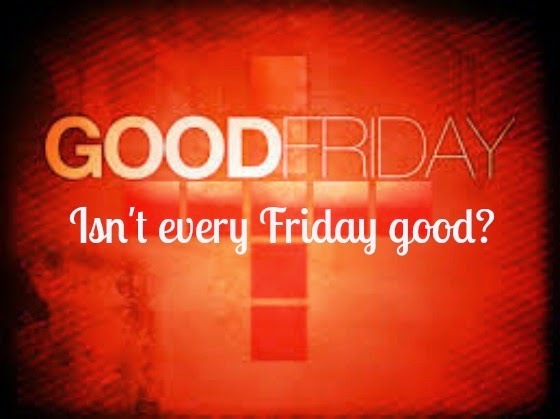 Although the phrase "Good Friday" does not appear in the Bible, Christians continue to celebrate the day set aside by the Roman Catholic Church in the 4th Century A.D to commemorate the crucifixion and death of Jesus Christ. Good Friday is also known as Holy Friday in the Romance Languages. It is interesting to know it is only called "Good" in the English Language. It is eye-opening to learn the history behind the origin of Easter. Read about its pagan or ungodly origin at christiananswers.net. If you have received Jesus and accepted his free pardon of sin, you know the Friday before Resurrection Sunday is good because Christ gave his all for you, for us. Romans 5:8 "But God commandeth his love toward us, in that, while we were yet sinners, Christ died for us." John 15:13 "Greater love hath no man than this, that a man lay down his life for his friends." Is Friday your favorite day of the week? Probably! Romans 14:5 says "One man esteemeth one day above another: another esteemeth every day alike. Let every man be fully persuaded in his own mind." I'm persuaded knowing Jesus as my Savior and realizing he was born and resurrected because he loves me, every day is Christmas and every Friday is "Good Friday"! What's your opinion? Do you recognize every Friday as Good and every day as Christmas?